The Department of Human Physiology with Community Health was established in 1990. This was the second University where Human Physiology was introduced as a basic science. The main goals of the department are to promote teaching and research with special emphasis on community health including advanced training and field studies and to provide exposure to the students towards updated research activities and training. Different programmes are offered by this department including Master’s and doctoral programmes. The semester system has been introduced in this department since 2008. Course-wise Student Teacher Ratio: in M.Sc. it is 6: 1; in Ph.D.: it is 5:1. The students of this department have been successful in several competitive examinations including NET, SET: GATE, School Service Commission Examinations. In the last 5 years (2009-2014), 140 research publications, 3 books and 2 patents have been furnished by the esteemed faculty members of this department. Thirty 0ne (31) research papers have been published in peer reviewed International journals in the last year. One text book “Basic concepts in Immunology” and four book chapters have been published by the faculties of this department. The faculties of this department are the members of several editorial boards of peer-reviewed journals as well as member of Ergonomics Sectional Committee, PGD 15, Bureau of Indian Standards, New Delhi. The faculties of this department have also received awards / recognitions at both national and international level. One of the faculties of this department is recently recognized as a Fellow of West Bengal Academy of Science and Technology (FAScT). The department has been receiving research funding from DBT, DST, ICMR, CSIR, DRDO and UGC. 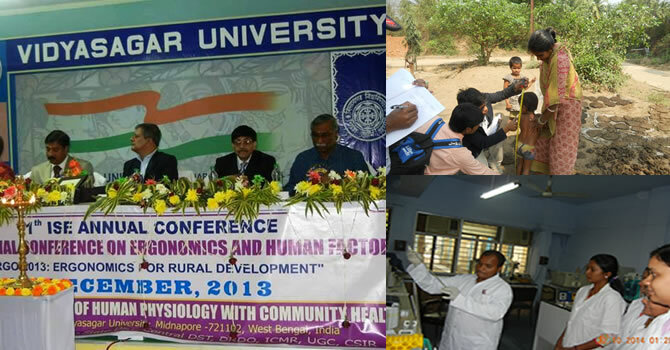 The department have also received DST-FIST (total grants received: 28 lakhs, 2008) and UGC infrastructure grant (Rs. 20 lakhs in 2007and 2009).Total research grant of the department is 1.09 crore including research student scholarship for the last 5 years (2009-2014). Department has organized ‘International Conferences on Frontier in Biological research (ICFBR- 2012)’ in February, 2012, “International conference on Ergonomics and Human Factors “ Ergo 2013: Ergonomics for Rural Development” in December 2013 and also one International workshop on ‘Kinanthropometry’ in May, 2014.